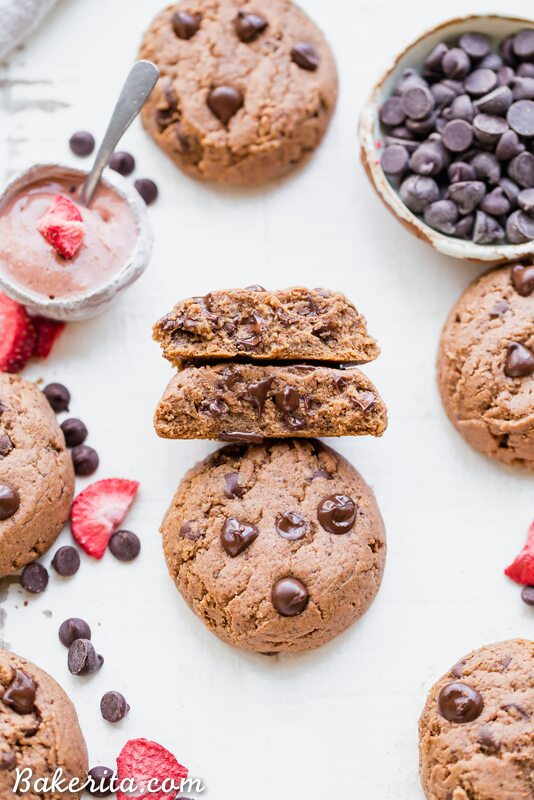 These Flourless Strawberry Chocolate Chip Cookies are thick, gooey and SO delicious, with a fruity strawberry flavor and melty chocolate chips. They’re gluten-free, paleo, and vegan, and made with just six ingredients! These Flourless Strawberry Chocolate Chip Cookies have been my kryptonite for the past week as they’ve been living in my fridge. See, I’m normally pretty good at resisting my treats (otherwise I’d probably weigh a lot more! ), but these? I can’t seem to resist them. Usually, I let baked goods hang out in my fridge or freeze until I can bring them to a friend or one of my parent’s, for them to bring to work. These ended up devoured ALL on my own. I crushed them, usually enjoying one at night with my hot tea, and each bite was so good . They were inspired by another favorite of mine, these Flourless Almond Butter Chocolate Chip Cookies. The only one that didn’t get eaten was the one Hank managed to snag off the plate and throw on the ground. RIP, cookie. Let’s be honest though: another batch is likely in the future. 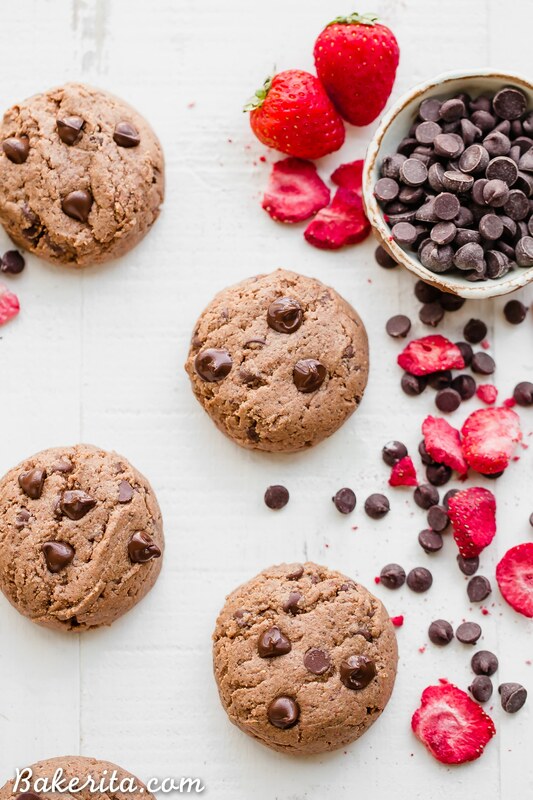 Especially because these Flourless Strawberry Chocolate Chip Cookies are made with just six ingredients, so they come together super quickly. They’re also gluten-free, paleo, and vegan, so no need to feel guilty when you devour the entire batch. 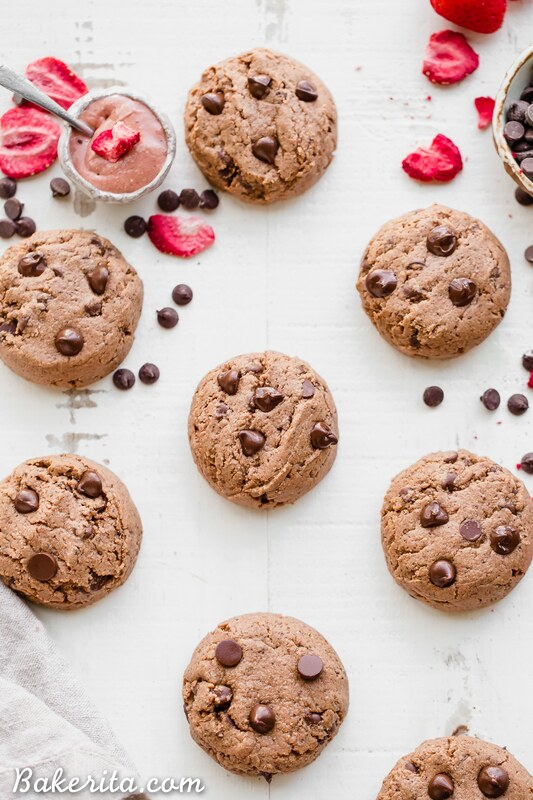 Let’s make Flourless Strawberry Chocolate Chip Cookies! 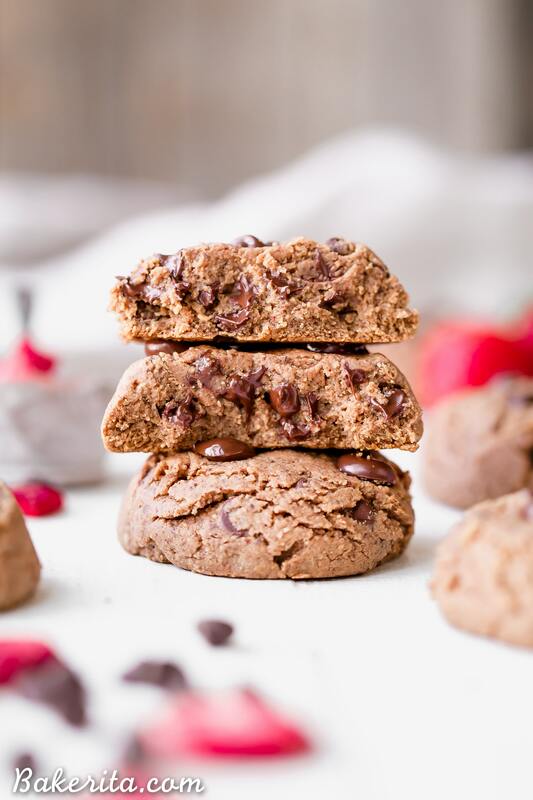 To get these cookies in the oven, you’ll need a few things: cashew butter, coconut sugar, a real egg or a flax egg, baking soda, freeze-dried strawberries, and chocolate chips. That’s it! Cashew butter is the base of these cookies. It replaces the fat and the flour that most cookies require by providing both moisture and structure. You could use another nut butter here, but the cashew butter is a nice and neutral base that lets the strawberry flavor *shine* and live it’s best life. I used roasted cashew butter, but raw would probably be even better since it’s even more neutral. Coconut sugar is my sweetener of choice here. It sweetens just enough without making things too sweet, and I ❤️ that it’s a low-glycemic sweetener so it won’t make your blood sugar go haywire the way white sugar will. You gotta have an egg too – a regular egg and a flax egg will both work. I used a flax egg in the ones pictured, for reference. A little baking soda helps give the cookies a little lift, and helps them to not be quite so dense and heavy. These are definitely a dense, fudgy cookie though! Finally, you gotta have the flavor boosters: freeze-dried strawberries and chocolate chips! The freeze-dried strawberries will be ground up into a strawberry powder that is a major punch-in-the-face of strawberry flavor. It also adds a little pink tint to the cookies, which we know no one is complaining about. So cute, right?! I found the strawberry flavor to get even better and stronger after the cookies sat for a day or two. And then, of course, chocolate chips. Gotta have them. I’m normally an advocate of chunks > chips because they melt a lot better, but I used chips here because I was out of chunks. It was still super delicious, but I’m definitely a chocolate chunks kind of girl. Use whatever you’ve got – they’ll both be awesome. 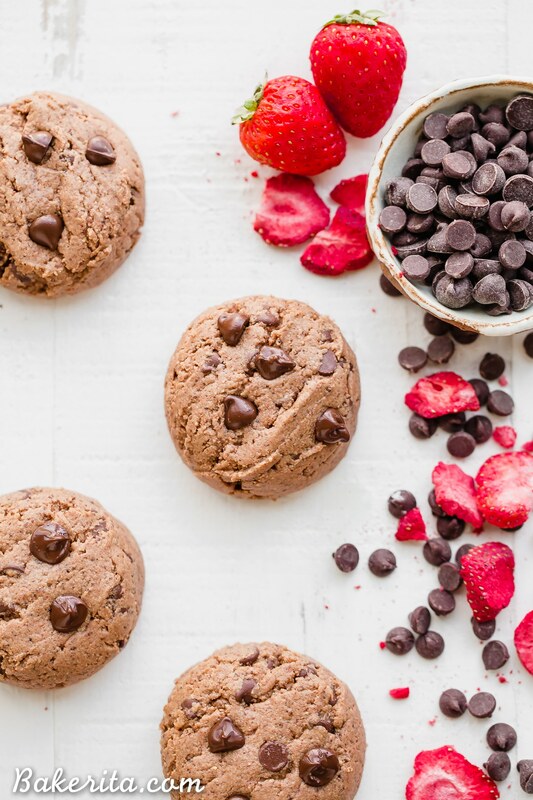 These Flourless Strawberry Chocolate Chip Cookies are rich and fudgy with the flavor of fresh strawberries shining through. And there’s melty chocolate in every bite. With just six ingredients, these cookies are hard to resist and perfect served with hot coffee or tea. Hope you’ll try them out, enjoy! 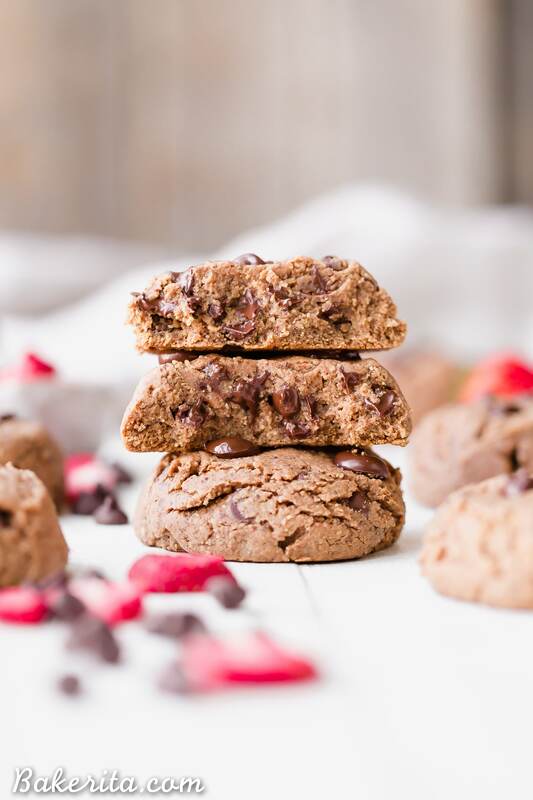 These Flourless Strawberry Chocolate Chip Cookies are thick and super rich, with a fruity strawberry flavor and melty chocolate chips. They're gluten-free, paleo, and vegan, and made with just six ingredients! Preheat oven to 350ºF. Line a baking sheet with silicone baking mat. In a medium bowl, whisk together the almond butter, coconut sugar, egg or flax egg (I used a flax egg), baking soda, and freeze-dried strawberry powder. Fold in the chocolate chips. Using a small cookie dough scoop, form tablespoon-sized balls of dough and place onto the prepared baking sheet. Bake for 8 to 10 minutes or until set. Let them cool for at least 15 minutes on the baking sheet, then transfer them carefully to a cooling rack to cool completely. Store leftovers in an airtight container at room temperature or in the fridge. Cashew butter cookies are definitely one of my favorite flourless cookies! These seriously look SO thick and chewy, Rachel! Loving the strawberry/chocolate chip combo! Hi Linda, thanks so much! I haven’t tried it that way and since it’s a liquid sweetener, it would definitely change the consistency of the cookies, probably making them thinner. You might want to reduce the amount to 1/3 cup so they don’t spread too much…but then you’ll lose some sweetness, so taste and adjust sweetness as necessary! I’d love to hear how it goes if you try it. Enjoy! Absolutely a keeper of a recipe. Can’t wait to serve them to my grandkids tomorrow. Thanks for the prompt response…I certainly Will let you know…maybe I’ll add about of almond flour in place of the sugar and go w the 1/3 cup of syrup. Just when i thought cashew butter couldn’t get any more addictive! I tried these today with the exceptions of using organic peanut butter and, since freeze dried strawberries we’re not available, I pulverized 1/2 c of fresh strawberries. I also added 1/2 c almond flour. I mixed the strawberries egg and peanut butter together. Then I mixed together the dry ingredients of almond flour, coconut sugar and baking soda. Then I blended all the ingredients together adding the chocolate chips. Though they weren’t as perfectly round as yours they were so yummy. Great for my granddaughter to have a treat that’s not full of the usual white stuff and her Mommy whose gluten sensitive can enjoy as well! Thanks so much! !